Tutti Designs: Have Faith . . .
Darlene with you today and it's my turn to share a new, inspirational creation using dies from the Tutti Designs Store. Have you checked out this new die company yet? If not, you truly owe it to yourself to pop over to see the fabulous die designs available. They just came out with their 3rd release so my creation today pulls from the new release as well as from the previous release. Isn't it nice when you can combine dies to create something BEAUTIFUL! 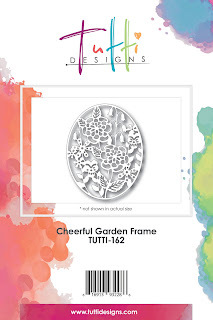 Cheerful Garden Frame #162 and one of the word sentiments from the Snowglobe Expressions die set #143. Here's a few tips on how this card was created. First I chose the neutral colored designer paper I wanted to use for the background then went from there. It was a double sided paper so the strip I had to cut to get the right dimension for my background panel was simply flipped over and used as a coordinating accent piece. I adhered my beautiful Garden Frame to a solid gray panel the fussy cut around it to achieve my matting. I used the corner scrap to die cut the Faith die and played around with the positioning. My pieces are all laid out before I actually decide on how I want to put the card together and permanently adhere to my card base. The word looked 'okay' but I wanted it to pop a little more so I die cut another word using black card stock then off set them to create my word panel. 1/4" strips of black and red card stock give the accent panel a little added ZIP! Plus, a few embellishments using sequins and red Stickles glitter gives my card the finishing touches I was looking for. Please be sure to pop over to the Tutti Designs Store and check out all these fabulous dies.